• High performance zirconia ceramic ferrules allow for frequent, repeated insertion. • Standard LC, SC, ST, MTP and MTRJ connector options to suit specific applications. 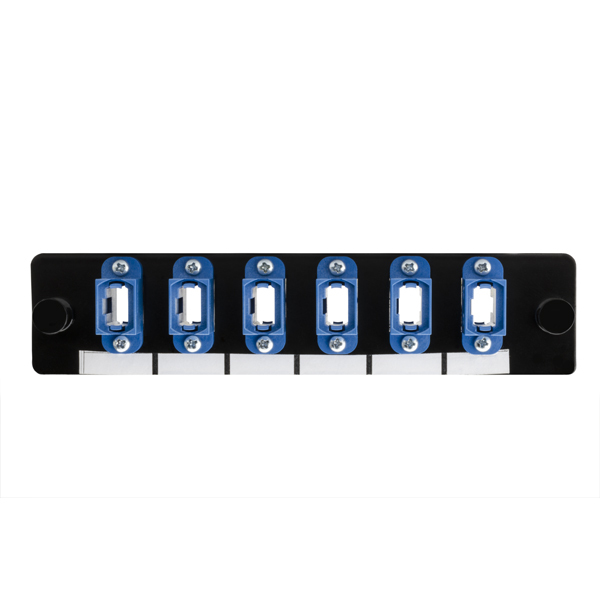 • “Snap lock” fixtures for easy and secure mounting. • Meet ANSI/TIA/EIA 568-C standards. • Meet ANSI/TIA/EIA 604 (FOCIS) connector interface requirements. • GSA compliant panels meet TAA requirements for use in government projects. • High performance zirconia ceramic ferrules allow for frequent, repeated insertion. • Standard LC, SC, ST, MTP and MTRJ connector options to suit specific applications. • “Snap lock” fixtures for easy and secure mounting. • Meet ANSI/TIA/EIA 568-C standards. • Meet ANSI/TIA/EIA 604 (FOCIS) connector interface requirements. • GSA compliant panels meet TAA requirements for use in government projects. For customized wall mount and rack mount fiber optic enclosures, HellermannTyton offers panel options featuring a variety of adapters to suit different preferences and applications. In addition to adapter panels with standard LC, SC, ST, MTP and MTRJ connections, HellermannTyton also offers custom solutions. Our adapter panels include options to accommodate OS1/2 in both standard and angled versions, as well as 62.5/125μm OM1, 50/125μm OM2 and 50/125μm 10 Gb OM3/4. HellermannTyton adapter panels are made with zirconia ceramic or phosphor bronze ferrules for minimal insertion loss contribution. Zirconia ceramic ferrules provided excellent durability and are an ideal choice for use in laser optimized multimode and single mode applications. HellermannTyton offers both standard and GSA compliant adapter panels. GSA compliant panels meet Trade Agreement Act (TAA) requirements, making them acceptable for use in US government projects.